For its Fish Friday Favorites series, McCormick enlists food bloggers to develop easy recipes. This week’s theme is “baked in sheet pans,” using McCormick’s packets of seasoning mixes. McCormick makes 18 different seasoning packets: two each for Bag & Season (for meats), Chili, Gluten Free, Gravy, Home Style Classics, Italian, Mexican, Slow Cooker and Snacks & Dips. Here’s more about them (scroll down the page). We thoroughly endorse these easy dinner ideas: fresh, nutritious home cooking in a half hour or less, with big flavors and minimal clean-up. 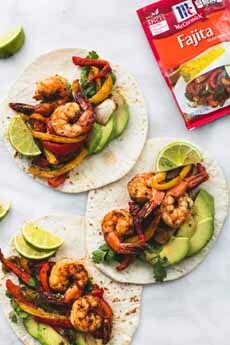 “Sheet pan chili lime shrimp fajitas make an easy, healthy, and delicious one-pan 20-minute meal—with tons of flavor the whole family will love,” says Tiffany of La Creme De La Crumb. Prep time is 10 minutes, cook time is 10 to 15 minutes. 1. PREHEAT the oven to 400°F. Combine the first 7 ingredients (shrimp through lime juice) in a large bowl. Stir to combine and coat the shrimp and peppers well in the seasonings. 2. SPREAD everything out on a large baking sheet pan in a single layer (note: line the pan with foil or parchment for easy clean-up). Items can overlap; just not heaped in a pile. Bake for 10-15 minutes until shrimp is pink, the tails begin to char slightly and the peppers are tender. 3. DISTRIBUTE the shrimp and peppers on top of the tortillas along with avocado slices. Top with freshly shopped cilantro and serve with lime wedges for squeezing. *Traditionally, a fajita uses the smallest tortilla, 6 inches in diameter; a soft taco 8 inches; and a burrito 10 inches. “Those of you who are observing Lent: Don’t let Lent have you fishing for flavor! This sheet pan meal is big on flavor—and you don’t have to sacrifice on taste,” says Alyssa, The Recipe Critic. 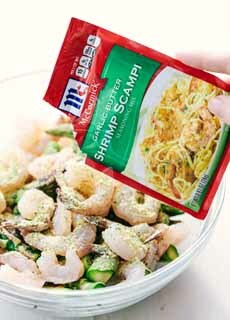 Who doesn’t love Shrimp Scampi†? Prep time is 5 minutes, cook time is 8 minutes. Shrimp and lime fajitas (photo courtesy Le Creme De La Crumb | McCormick). Seasoning the ingredients and  the final dish, emerging from the oven (photos The Recipe Critic | McCormick). 1. PREHEAT the oven to 450°F. Lightly grease a sheet pan and set aside (note: first line the pan with foil or parchment for easy clean-up). 2. PLACE the shrimp and asparagus in a large mixing bowl. Pour the melted butter, olive oil and lemon juice on top, sprinkle on the seasoning packet and mix until combined. 3. 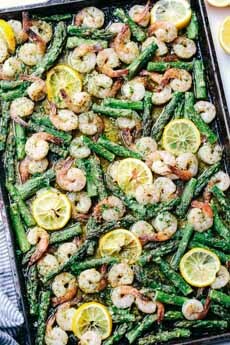 SPREAD the shrimp and asparagus on the sheet pan in an even layer (note: line the pan with foil or parchment for easy clean-up). Scatter the lemon slices on top. Bake for 8 minutes or until the shrimp is pink and cooked through. Serve immediately. SHRIMPS VS. PRAWNS: THE DIFFERENCE. Prawns and shrimps are both crustaceans with 10 legs. They can be found in salt water and fresh water all over the world, and have similar flavors. While the terms are often used interchangeably, with prawns, the first three of the five pairs of legs on the body have small pincers; with shrimps only, two pairs are claw-like. In the U.K. and Australia, prawn is the name consumers and restaurants use for what is called shrimp in the U.S. Both crustaceans are found in a variety of sizes. More information. After 5 minutes of prep time, baked salmon in orange-butter sauce is ready in another 20 minutes (photo courtesy Avery Cooks | McCormick). Prep time is 5 minutes, cook time is 20 to 25 minutes. 1. PREHEAT the oven to 375°F and place a piece of foil on the baking sheet to cover it completely. Place the salmon on the foil, skin-side down, with the longer side of the fish parallel to the longer side of the sheet pan. Pull the edges of the foil up 2 inches over the pan rim, or enough so that when you pour the butter sauce over the top, it will be contained in the foil. 2. 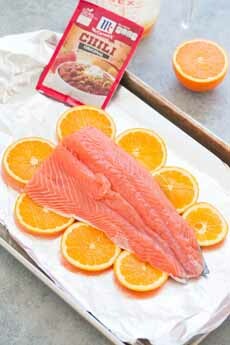 NESTLE the orange slices underneath the salmon, spaced evenly around the fillet. Set aside. 3. PLACE the butter in a microwave-safe glass measuring cup or bowl and heat on high power to melt, about 1 minute. Stir in the honey and orange juice. Pour or spoon about two-thirds of the mixture over the salmon; reserve the remainder. Evenly season with the seasoning mix, and add salt and pepper, to taste. 4. ADD another sheet of foil on top and crimp or pinch both pieces together to get the seal as tight as possible. If you have time, set the pan aside to allow the fish marinate for about 10 to 15 minutes; you’ll get enhanced flavor. Bake for 15 minutes. 5. REMOVE the pan from the oven and cut open up the top of the packet so the salmon is exposed (but the edges are still raised to contain the sauce). Set the broiler to to high. Spoon the reserved sauce over the salmon, if desired. Use your judgment: If there’s already lots of juice, you don’t need to add more (you don’t want it to start leaking). If you have extra sauce, pour it over the finished dish or bring it to the table in a pitcher. 6. BROIL the salmon for 5 to 10 minutes, or until as golden as desired. The exact broiling time will depend on the size and thickness of the salmon, oven variances and personal preference. Keep a close eye on the salmon because all broilers are different and you don’t want to burn the fish. 7. GARNISH with parsley and serve immediately. This recipe is best warm and fresh, but will keep airtight in the fridge for up to 3 days.